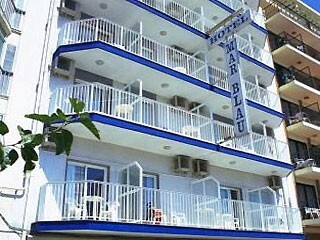 The Mar Blau offers comfortable rooms which all feature Air-conditioning, television and direct-dial telephones. Most rooms have a balcony and many have views out over the beach and sea. This is a family run hotel and the friendly staff go out of their way to get to know you and cater for your every need. Enjoy the atmosphere of the hotel bar, with it's entertainment programme featuring games, competitions, dancing to live music and occasional live shows.